Crysis 2 is one of the most graphically intensive games so users may be experiencing several different problems with Crysis 2, including crashing, freezing, disconnecting online, lag, errors, artifacts and more. Sit tight while we try to sort out some of that for you. Step 1. Update to the latest version of Crysis 2. This fixes the issue for many. Step 2. Update to the latest Catalyst Drivers here. Step 3. Download the latest Crossfire Profiles using the link above and going to AMD’s site. Step 4. If you still have issues, download Radeon Pro and run Crysis 2 with F.E.A.R. Crossfire Settings. If that does not work and you still have issues, here are your options. Option 1. Get out of full screen mode. This fixes the problem. Option 2. Disable crossfire via Catalyst. Option 3. Wait for additional patching. AMD or Crytek will fix it… it’s just a matter of which will take the initiative. This is a known issue that Crytek is working on to resolve. Please follow the following steps, as it remedies the problem for some people. You might just have to wait in this case. Step 1. Make sure your video card drivers are up to date. You can download the latest Nvidia Card Drivers here. You can also download the latest AMD/ATI Drivers here. Step 2. Check your computer temperatures. A game like this is a sure way to overheat a computer if you do not have the proper cooling set up. Step 3. If you use AMD/ATI cards, try turning off adaptive anti-aliasing and Catalyst AI. Step 1. Disable your firewall on your computer. This includes the built in windows firewall. Step 2. Disable your anti-virus (temporarily at your own risk) and try again. Step 3. If you have a router, disable the firewall and/or turn on gaming mode if applicable. Step 4. Use port forwarding to allow connections to work. Step 1. 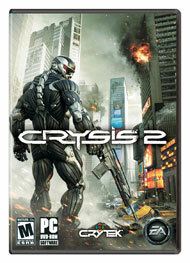 Download the Crysis 2 FPS increasing application here and set everything to high. Step 2. If necessary, disable AA. This is a known issue. Don’t worry, this is not your fault. This will be fixed through Crytek’s pending game patches. This entry was posted	on Tuesday, March 22nd, 2011 at 6:42 PM	and is filed under . You can follow any responses to this entry through the RSS 2.0 feed. You can leave a response, or trackback from your own site. Here is what I did to vastly improve my framerate while retaining great image quality. I downloaded the following application and used it to set everything to high except AA. (Anti Aliasing) I entirely disabled AA. There is not much need for it really. I know. But a friend asked me if it was worth the price he paid and I offered to give it a whirl and see what I could learn. Even without AA the textures have few jagged edges anyway, so I was able to advise him to not go waste money on a new video card. Crysis 2 does not need an uber rig. It is a console port. It is nice to see the site again. I will have to write another review soon. I am thinking of Gothic Forsaken Gods now that the community patch has been released. I have a lower end gaming rig and I get good FPS on 1440×960 on gamer. Although i’m having issues where the game completly crashes my PC, graphics get weird colors and freeze then Comp powers off, and it’s only this game that does it. Rig Win 7 ultimate 64bit, amd athlon 7850 BE(2.8 dual core), nvidia 9600gt (OC edition or something like that), and 2 gig ram at 600 some odd hmz. Same issue here as Spectre. Computer turns itself off for no good reason. I keep having a memory allocation error and cannot find a fix anywhere on the internet, can you guys suggest anything please? could you tell us your system stats? Thanks, your solution coverup almost everything that a gamer can face during a game play.. ThumbsUp!!! Keep it up !! Hi, I have the same issue as Spectre057, I have a phenom x4 840 and and a 9600 GT (non-oc’ed) and after 20 mins of playing screen is filled with weird color dots and makes it un playable, if you know the solution please tell me. This is the true rig I have right now and it’s an AMD @ 2.2Ghz single core with 2.5GB Ram with a Radeon HD 2400 with 256MB and Windows 7 32bit Ultimate. The Game runs a little choppy at in-game vids but still playable. Only get an error at “Out of the ashes”. What may cause this error since all other levels played till here? Ooops I forgot to mention that the Game is Crysis 2.